On a momentous visit to the aquarium, Elliot discovers his dream pet: a penguin. It's just proper enough for a straight-laced boy like him. And when he asks his father if he may have one (please and thank you), his father says yes. Elliot should have realized that Dad probably thought he meant a stuffed penguin and not a real one . . . Clever illustrations and a wild surprise ending make this sly, silly tale of friendship and wish fulfillment a kid-pleaser from start to finish. 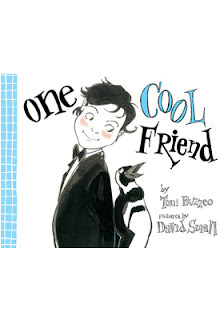 One Cool Friend is one cool book. My child had picked this one up from his school library and I'm glad he did! The story was cute. The illustrations were awesome. The little details with the speech bubbles were unique. I loved the ending. I'd suggest this for kids aged 4-8. And what's wonderful is that Toni Buzzeo provides a curriculum guide and a reader's theater script to go along with this book on her website.